Situated along the eastern edge of Spain, Valencia is notable for its colourful and exuberant festivities. In a country that does lively celebration like no other, this is no mean feat. More than 5 million overseas visitors choose the Valencia region as their holiday destination every year and many more choose to spend longer there learning the language. What’s certain is that few go home without lasting memories of the region’s vibrant culture. Between 12 and 19 March, the city of Valencia plays host to Europe’s most spectacular party. Las Fallas is a 5-day extravaganza involving the creation of huge papier-mâché and wood sculptures, and a quantity of fireworks that puts Guy Fawkes night to shame. Visitors to the festival have 4 days to enjoy the colourful sculptures (known as fallas), which are created by local artisans and can reach heights of up to 15m. At midnight on day 5, each falla is set alight to the explosive accompaniment of fireworks. At 9am on the last Wednesday in August, Spain’s messiest festival begins. It begins as a seemingly benign affair, with pastries and rolls served in Buñol town square, approximately 38km to the west of the city of Valencia. At 11am, a large pole with a ham attached to the end is raised into the air, which the assembled masses attempt to pull down. When they manage it, a rocket is fired into the air, giving the signal to nearby trucks to tip over 100 tonnes of ripe tomatoes on to the crowd. The following hour involves a large-scale tomato battle, with people merrily hurling tomatoes at one another and writhing around in the ketchupy pulp. The annual La Tomatina festival began in 1945 and has been attracting large crowds ever since. On the day of the tomato-hurling, the local population increases from around 9,000 to over 40,000. Goggles and old clothes are a must – though the local fire brigade obligingly hoses down revellers at the festival’s end. 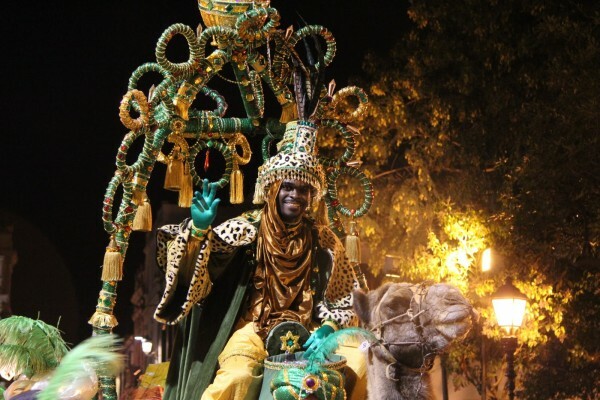 During Spain’s Holy Week, a number of processions take place throughout Valencia. One of the most surreal is carried out by the dour penitents of the Santisimo Cristo del Salvador and el Amparo brotherhood, who surprise sunbathers on Playa de la Malvarrosa accompanied by a full brass band. Other events worth catching include the Gathering of the Palms, the Procession of Placing in the Tomb, and the Resurrection Cavalcade. January involves Melchior, Caspar and Balthasar plus their entourage of 33 spectacular floats and 1,000 costumed helpers. The commemoration of Valencia’s second patron saint begins on the evening before the 2nd in May. Festivities kick off with a concert in the Plaza de la Virgen, featuring extravagant fireworks, traditional folk music and dancing. The morning after, at the eye-wateringly early time of 5am, the faithful attend an open-air mass known as La Misa Descuberta. Later, a large sculpture of the saint is carried across the Plaza de la Virgen to the city’s cathedral. 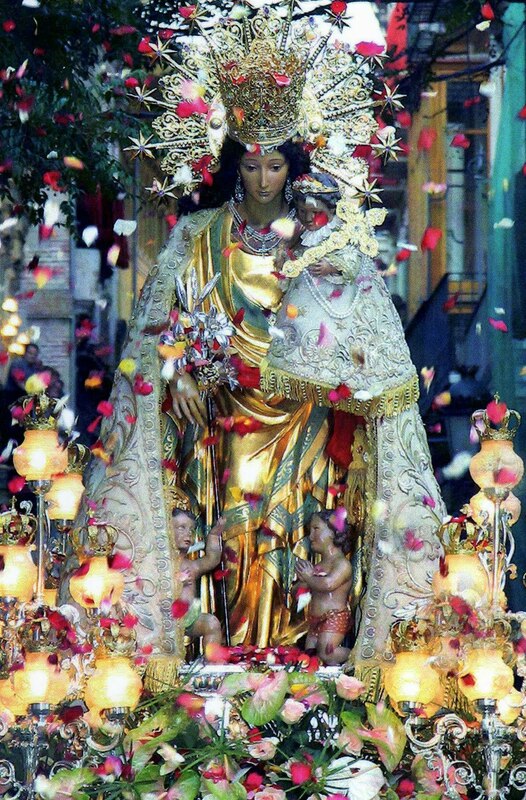 Later in the day, the sculpture makes another appearance after a 5-minute-long fireworks display, when it is carried through the city to the old town, where the virgin is greeted by the assembled masses and showered with flower petals. The Night of St Juan, also known as the Night of the Witches, celebrates both the saint and the arrival of summer on 23 June. The inhabitants of Valencia congregate on the city’s beaches, where they light bonfires, listen to music, drink, dance and let off fireworks. Many children and teenagers traditionally wash their feet before jumping over the bonfires, which is thought to make wishes come true, though nowadays it is more a display of machismo than anything else. The Feast Day of St Vicente Ferrer occurs on the first Sunday after Easter and celebrates the life of Vincent Ferrer, a Valencian Dominican friar who gained acclaim as a logician and as a missionary. The festivities date back to 1561 and involve local families making their way to a chapel, where children are encouraged to drink from St Vicente’s well. Altars and stages are erected throughout the city’s 13 neighbourhoods, and children and adults alike dress up to re-enact St Vicente’s miracles. This post was brought to you by esl-languages.com, who arrange study abroad language courses in countries around Europe and the rest of the world. For more information visit the ESL Languages website. Find more great places to visit in Spain on our Europe page and Facebook page! Being the largest and most populated city in Scotland, Glasgow has much to offer tourists coming from all over the world and can be a great escape in the UK for backpackers wanting to do things on a budget. Glasgow is certainly budget friendly and not as hard on the purse as other large UK cities like London and Edinburgh, so if you want a taste of UK city life without breaking the bank, then this is the place for you. From the price of food and drink to the cost of accommodation, Glasgow offers loads of options to suit those on a shoestring. For accommodation, there are plenty of hostels available if you want to just turn up in the city and find your favourite, or you could use a website like www.zoover.co.uk where you can check hotel reviews and see if anything stands out to book in advance. Most likely arriving in the centre by train or bus at either Queen Street Station or Central Station, the visit will naturally start in Buchanan Street, which is a central shopping street lined with cultural buildings and many opportunities to dine. Arriving in the north end of the street, one has the chance of visiting the Gallery of Modern Art located closely at the Royal Exchange Square. Further up the street end sits the Glasgow Royal Concert Hall which is the performance base of the Royal Scottish National Orchestra. The Glasgow City Chambers located at George Square are a pleasure to the eye. Entering the hall, everyone will be mesmerized by the Italian marble interiors which have more than once served as film settings in the past. Moving up the majestic stairwell, one will be eyed by chief figures of bygone days sitting on the wall in portraits. Participating in a guided tour through the building, everyone has the chance to sit on a chair which was once occupied by Queen Victoria! As the Scottish Centre for Design and Architecture, the Lighthouse underlines the fact that Glasgow is Scotland’s centre of modern art. It offers exhibitions, installations and allows every visitor to overview the whole city of Glasgow from its Mackintosh Tower, which is named after its father-architect Charles Rennie Mackintosh. After moving up the spiral stairs, one sees a silhouette of chimney pots resisting the storm pelting through industrial and historical rooftops. It is a nice idea to close the day with a visit to the Glasgow Cathedral, which dates back to medieval times. Beside the impressive architecture, there may be the chance to listen to the church choir and a concert. Those who like it creepy might even consider visiting the “Glasgow Necropolis” – the main cemetery. Glasgow is a proper place to get a taste of British culture, so why not travel further south, to the north of England, to enjoy even more? Or check out other destinations in the UK and Europe here on Top Backpacking Destinations. This is a featured post from one our our partners. The National Forest is one of the UK’s proudest achievements; eight million trees planted by local councils, landowners, schoolchildren, charities and individuals, including one by the Duke of Cambridge. It’s a national treasure – but few realise its potential as an affordable holiday destination, especially for those seeking a budget holiday in the UK. The forest has a number of hotels, while the YHA has an inexpensive family-friendly hostel with private rooms right next to the central Conkers visitor centre. There are all sorts of things to discover in the area, and if you’re lucky, you may even get to plant a tree in the forest! The National Forest promises days of discovering the UK’s amazing and varied wildlife, without having to spend a single penny. Footpaths and cycle paths wind across the whole area, providing plenty of opportunity to see as much or as little as you like – you could even try travelling through the hills and fields on horseback! There are several beautiful reservoirs with picnic areas and playgrounds, accessible from most of the woodland walks. Fishing is another popular way to discover the nature of the National Forest, and a great opportunity to learn a new activity! There are so many attractions in the National Forest area that it can be difficult to know where to start. Take a walk through historic castles and gardens, or head to one of the zoos and nature reserves in the area to learn more about the UK’s native flora and fauna. Surrounding National Trust attractions are a great way to see the area’s heritage and you can spend days on end just exploring the beautiful surroundings. There are regular farmers’ markets and a large number of farm shops in the area, ideal for hungry backpackers looking to try some local produce, and much cheaper than stopping in pubs and restaurants for food. You’ll also spot a number of food fairs cropping up throughout the year, so check in advance to see what’s on. If you do want a special meal out, there are plenty of affordable places to eat, many of them serving tasty home-grown food. – Ashby de la Zouch Castle – A 15th century manor house, featuring extensive remains including the chapel, buttery, tower and even a secret kitchen tunnel. – Bosworth Battleﬁeld Heritage Centre & Country Park – Learn everything you ever wanted to know about Medieval battlefields, with amazing displays and archaeology tours detailing the rise and fall of the Tudor Empire. Visit in August to see the impressive re-enactments! – Marston’s Brewery – A must for beer lovers, this traditional Victorian brewhouse includes a tour of the brewery itself and a tasting session with the brewing team. – Woodland Ways Bushcraft and Survival – Essential training for even the most seasoned camper, the survival sessions give you the skills to build a shelter and light a fire as well as plant and animal identification, all in the heart of the forest. – Bluebell Arboretum and Nursery – A stunning woodland walk with rare plants on display and a fantastic collection of specialist trees and shrubberies – ideal for the botanical enthusiast! When deciding to go on a long-term backpacking trip, it is imperative to choose a good starting point. If you decide to start in London you will have a few benefits during your travels. Firstly, after having traveled to London, you will never be shocked about anything being very expensive since you’ve visited one of the most expensive cities already. Second, you will start in one of the most iconic cities in the world which is packed with fantastic sights and amazing things to do. Third, you can still afford to have a few treats before you get into full budget mode! When in London it might be a good idea to still indulge yourself before always having to be aware what you buy or do during your backpacking. With all the massage vouchers available for London you might even decide to get a wellness treatment so you will be prepared and all relaxed for your onward travels. While you are in London you have to expect everything to be inordinately expensive, so it might be a good idea to relieve yourself of some of the needed expenses. Vouchers are a good alternative and will help you save a lot of money on numerous sightseeing activities, for example, with London aquarium vouchers. While browsing through all the vouchers you might even come up with great activities for your stay in London. Another idea to cut off some of the expenses is to save on accommodations. A great way for backpackers in general is to “couchsurf”. While couchsurfing, you stay on another person’s couch for the time of your stay in the city, for free. Just help them out with food or drinks and they will be happy to be your host. There are so many gorgeous places in London that many decide to write a whole book about them. Here are five tips on what you should definitely see and do while in London. A trip to London wouldn’t be completely satisfying without watching this spectacle. In the summer you can see this every day at 11.30 am at Buckingham Palace. So this is a great way of combining the guard change, which you can also see at St. James Palace, and having a look at the famous Buckingham Palace. This market is actually many markets rolled into one, so take your time to see everything and check out the offers there. This market in Notting Hill is also a place to see and be seen – keep that in mind while wandering along. This is the first thing a London traveller should do to get a slight overview over the main sights and the city in general. Built in 2000, this huge observation wheel is the newest landmark in London. If you want to take a peek of the city from the air, the London eye is the place to be. You might not be be able to buy something from the world famous luxury department store, but it’s worth going just to walk around, it’s like a small town! This is just one of the ways you can indulge yourself in London but it is a traditional and interesting one. What a shame that there are no vouchers available for Harrods!